Learn how to use cryo-imaging in your research by registering for the upcoming webinars. You, like many others, may have questions inadequately addressed by traditional in vivo mouse imaging. Where exactly did my labeled cells go? Are my targeted theranostic nanoparticles getting to the target tissue? Is my new in vivo imaging approach faithfully labeling disease? Where is my reporter gene being expressed in a mouse? 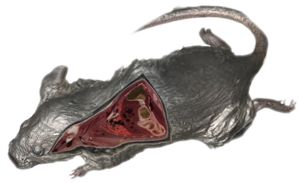 Cryo-imaging now can provide you high-detail answers over mouse-sized volumes! In 3D. In real color. With microscopic resolution. Based on a patented technology, cryo-imaging allows detection of fluorescently tagged stem or cancer cells anywhere in a mouse. With its multi-spectral fluorescence imaging, it can detect fluorescent protein reporters, imaging agents, and nanoparticle theranostics. 3D microscopic color anatomy aids studies of phenotyping and imaging biomarker validation. For whole-mouse, embryos, or excised organs, cryo-imaging provides your application the right resolution, field-of-view, contrast, and sensitivity. Please contact us with your specific application. Our model is simple. You ship us your samples and we deliver results. This simple process allows you to concentrate on your experiment and provides the data with sensitivity, resolution, field-of-view and contrast so that you can draw powrful inferences. Visit the Services page to find out more. In addition, our engineers can help you analyze images from your other small animal imaging modalities. Learn more. The CryoViz Instrument allows you to do cellular and molecular imaging where you get color anatomy and exactly-registered multi-spectral molecular fluorescence. It involves easy samplepreparation, unattended imaging sessions and single-click 3D visualization. An integrated software suite provides automated multi-scale 3D color visualization, quantification and analysis. Learn more.